Love natural toys? 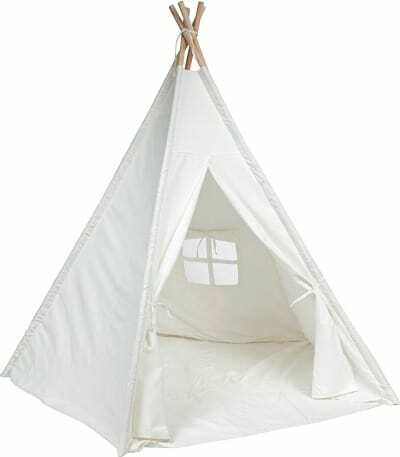 Here are some of our favorite natural toy gift ideas for kids. Even before I found out I was expecting our first baby, I already knew I wanted our kids to have natural toys. I wanted to avoid chemicals, plastic, and all the garish character toys that are so popular. My husband and I started collecting natural toys even before our baby was born! We hit discount stores, thrift stores, and consignment shops in search of natural, wooden toys. We also asked for specific toys from grandparents for Christmas and birthdays. Here’s part of what we’ve collected over the past 18 years of parenthood. When our oldest was just a baby, we invested in a huge set of natural wooden blocks. These have probably been the most-played-with toy we’ve ever owned. 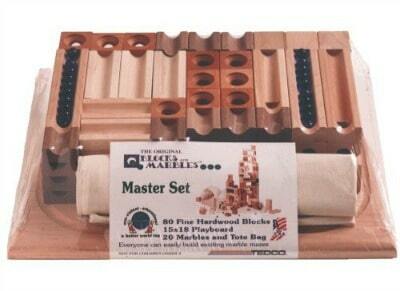 We also have a set of wooden castle blocks to go with the basic set. 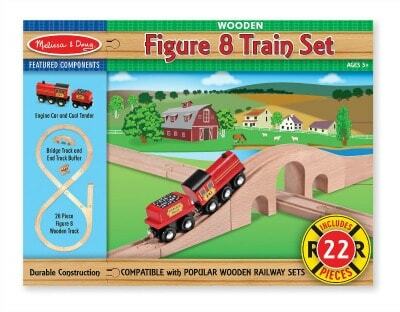 Our youngest children have played for hours with this classic wooden figure eight train set. This set of wooden train cars goes with it. This wooden barn is also a favorite, and I love these wooden animals (ask grandparents for these!). 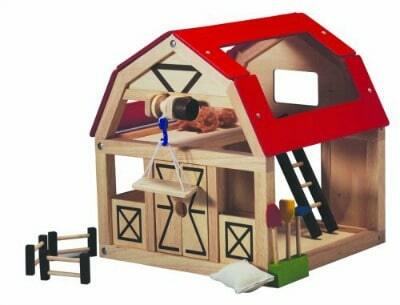 When I was a girl, my most memorable Christmas present ever was the dollhouse my dad built for me. I loved it so much that it was definitely my favorite toy. We got our children this dollhouse when they were younger, and it has held up well to small hands. 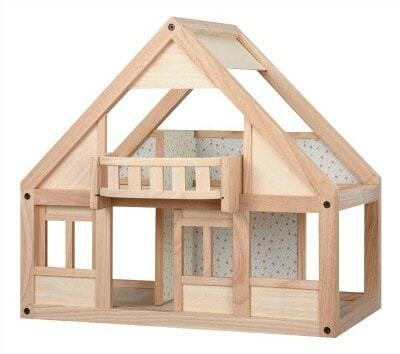 It’s definitely a great beginner dollhouse. 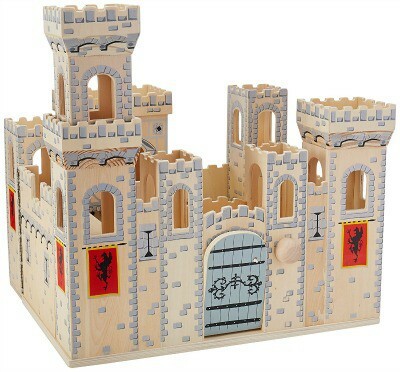 My youngest received this wooden castle for his birthday, and it has been much-loved. It currently lives in the corner of our living room. 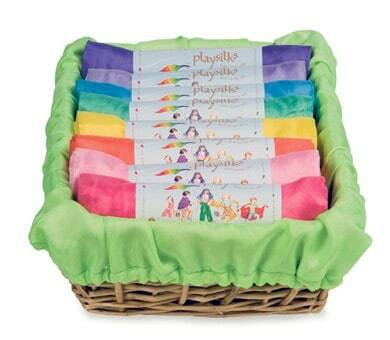 I first learned about playsilks 17 years ago when I was expecting my second baby. They’re a beautiful natural, versatile toy. You can make your own or you can find them here. My kids have always loved dressing up. Through the years we’ve always had a dress-up bin filled with playsilks, skirts, dresses, and actual costumes. 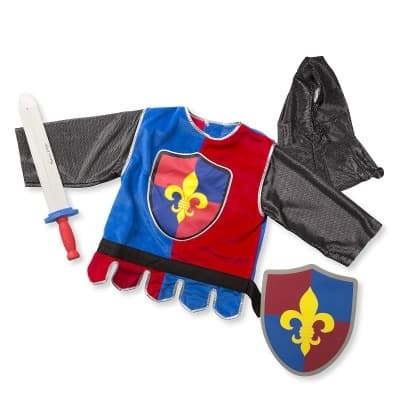 Melissa and Doug makes some cute costumes for younger kids. This is a different brand, but my son absolutely loves this one. Add a wooden sword and shield for a complete costume! Marble runs are classic toys. When our kids were finally all old enough to play with marbles without putting them in their mouths, we got this wooden marble run. It takes some skill to put together, but it’s good for hours of fun. 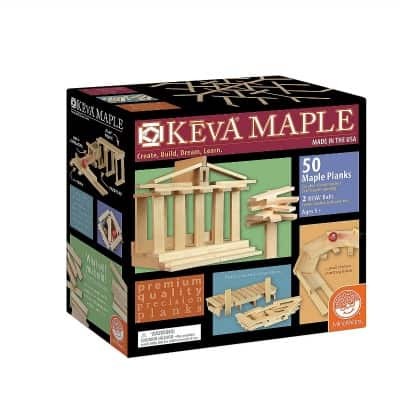 Everyone loves these Keva Maple planks. They’re a great natural toy for older kids as well as younger ones. When my kids were little, my mom made them a canvas teepee. They spent hours and hours playing with it inside and outside, and it’s still in use today, over 10 years later! Puppets are great for imaginative play. Our favorites are these Folkmanis puppets. They’re very well-made and beautiful. From the time our kids were little they had a set of child-size musical instruments. In addition to percussion instruments, we also had a lap harp and a xylophone. 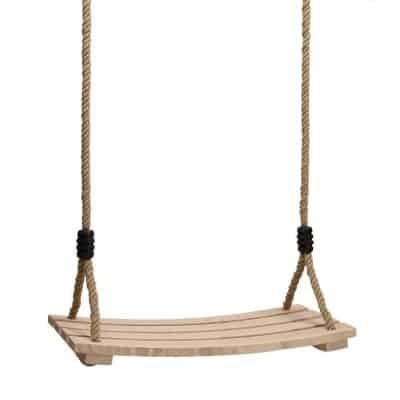 One of our favorite natural toys is a simple wooden tree swing. Our kids (big and little) love swinging on ours. 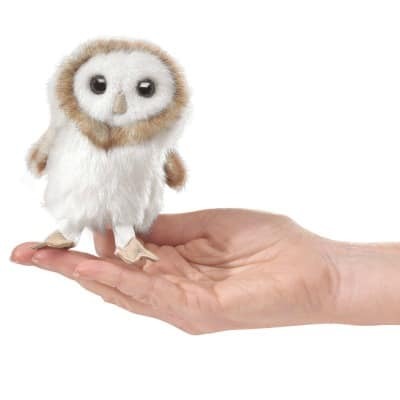 If you’ve ever looked at some of these natural toy gift ideas before, you’ll notice that generally speaking they’re not cheap. It always feels cheaper to just buy the usual plastic toys. As I mentioned above, one of the ways we were able to afford some of the toys we wanted for our kids was to ask grandparents for them. We also weren’t afraid to buy used toys if they were in excellent condition. Don’t forget to check discount stores like T.J. Maxx and Marshalls. 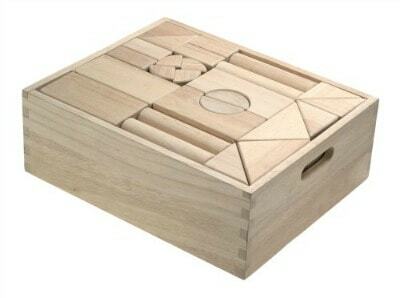 We’ve found several nice wooden toys, puzzles, and games there. And finally, don’t forget about Swagbucks! We regularly receive free Amazon gift cards just from using Swagbucks. We currently have $50 in Amazon gift cards that we’re saving for Christmas gifts. You can sign up here. If you’d like to learn more about Swagbucks, read this post. These are my favorite kind of toys! I love the list that you put together. Thank you for sharing with us at #LiveLifeWell. Those are some great toy ideas! Thanks! These are some great gift ideas – thanks for sharing with Party in Your PJs! We’ve had a wooden castle for years, and it’s still a favorite with all three of our kids. Thanks so much for sharing at the #happynowlinkup! It’s such a great classic toy! 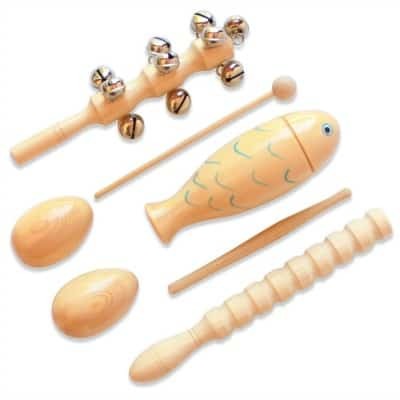 This is such a great collection of natural toys. I actually think they are much more lovely and visually appealing than a lot of the plastic ones out there. There is something so classic and lovely about the natural ones and healthier to-boot! I agree, they’re so much nicer than plastic! Great ideas…we actually have a lot of those including the trains, marble run and teepee! Hope you have a great weekend. How fun that you have some of the same toys! I hope you have a great weekend as well, Jaclyn!